In my initial blog on the modernization of finance, I referenced Gary Simon’s belief that data governance will become the most prominent function for modern finance. I agree on that. The creation of an information-centric data hub, based on a single data-point model and a centralized collection of data from multiple sources, is a key step toward achieving effective and efficient data governance. In addition to storage, a data hub adds other value to the data, such as validation and security. It also provides a single point of truth to store validated data by finance at a granular level to service operations outside of the finance department. This blog post will focus on the rationale behind a data hub approach for analytical information and what changes need to occur in order to make data governance a reality for your finance organization. Why Do You Need an Information Centric Data Hub? Most of us find ourselves swimming in data – and the pool keeps getting bigger by the month. Whereas finance once strictly focused on financial data, the growing demand for analytics, strategic insights, integrated reporting, and integrated financial planning has most finance organizations wrangling with operational data from a range of source systems. And in taking on greater strategic responsibility, finance is becoming the de facto custodian of all important company metrics, not just financial data. Finance’s traditional data management practices just don’t cut it when it comes to harnessing the three Vs of big data – volume, velocity, and variety. The imperative for modern CFO’s is to manage data in such a way that it is consistent, reliable, timely, and accessible whenever needed – no matter its source. With a centralized data hub, finance can create common data definitions and establish rules for data extraction, validation, and transformation. Additionally, data is kept current with scheduled imports from all important source systems, so planning and analytics work is always based on the most current information. Through managed permissions, operational leaders also have access to this centralized source of data for their own planning and budgeting work and have the responsibility to keep this up-to-date themselves, while finance facilitates this process in its role as a business partner. The diagram below depicts how most finance organizations currently manage data. 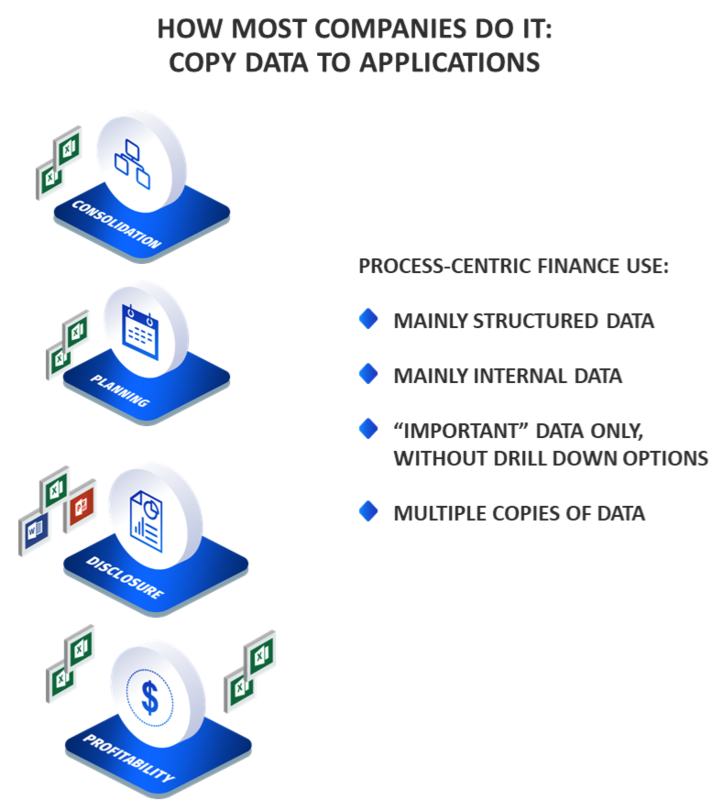 You see that in order to support the entire planning and control cycle, multiple applications with their own data storage (and often definitions) are used in the various sub-steps of the cycle. The drawbacks of this approach are many. Because data is siloed, there is no way to guarantee data consistency between applications. Nor can data be automatically reused. Tracking data sources, auditing changes, and managing progress across the cycle are all impossible. And, when data is entered into any of these applications via spreadsheets, the risk of manual errors and version issues is introduced. Why a Data Hub Is Key for Modern Finance? With a data hub, data is captured only once to be used for the various sub-steps in the planning and control cycle and for the different reporting and analysis needs of various stakeholders. As an example, you can think of FTE-data, which is needed by most departments for budgeting and reporting purposes and for social responsibility reporting. If the data is captured and validated only once, then no further reconciliation and checking is needed. For this data-driven approach, a data hub is used to store all data for the office of finance. Sub-sets of this data are then used in the various applications which are interconnected. For example, corporate tax reporting is based on the commercial balance sheet from the consolidation and reporting app. In this way, even calculated or derived data is completely traceable and auditable. 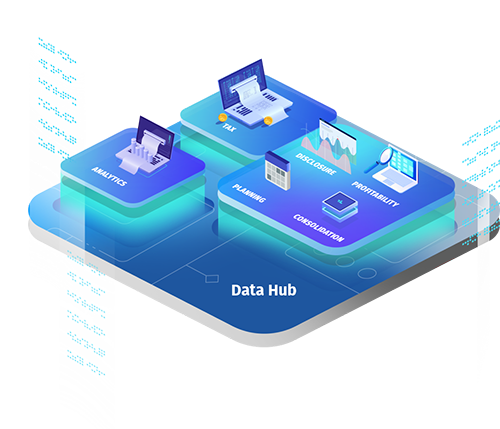 This data hub concept is explained in the image below. Modern technology makes it possible to create a single point of truth for all critical enterprise data for financial close, compliance, financial planning & analytics. With a centralized approach to data storage and governance, finance can aggregate data needed for consolidation and statutory reporting purposes, while the FP&A teams can forecast at the SKU-level with operations and sales can access the latest corporate data for e.g. weekly forecast updates. Innovation in thinking and technology is essential in helping the modern finance function overcome the challenges of dealing with the highly granular, diverse data that is exponentially growing in most organizations – while simultaneously improving the timeliness and reliability of reporting, forecasting, and other analytic work.